Las Vegas has a variety of accessible guest rooms. Hotels have rooms with roll-in showers, transfer showers, tubs with built-in seats and tubs with portable seats. Las Vegas makes everyone feel welcome. Your preferred reservation agent or hotel ADA specialist can help you find a room that meets your clients exact needs. 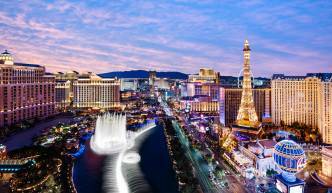 BOOKING YOUR ROOM - Las Vegas has more accessible guest rooms than any other city in the country. Hotels have rooms with roll-in showers, transfer showers, tubs with built-in seats and portable seats. Please speak with your reservation operator about your specific needs. If you require additional details, ask for the hotel&apos;s ADA specialist. TAXI SERVICE - All taxi companies in Las Vegas have lift-equipped vans accommodating one wheelchair. Call from your room, use any dedicated taxi phone or ask the doorman at your hotel for an accessible taxi van. Click here for transportation listings. CITY BUS/PARATRANSIT - Our RTC (Regional Transportation Commission) bus service is fully accessible, including buses that are lift-equipped, have low floors and kneel, and accommodate up to two wheelchairs. Reduced fares are available for seniors and persons with disabilities. Call CAT-RIDE (702-228-7433) for routes, schedules or help in using the system. The "Strip" bus runs 24 hours a day. If you are certified to ride paratransit in your home city, bring your certification and you will be allowed to ride up to 21 days without having a Nevada certification. To schedule rides, call 702-228-4800 one to three days in advance. PARKING - Bring along your hometown dashboard parking permit from your personal vehicle if you plan to rent a vehicle in Las Vegas. Out-of-state permits are recognized. Temporary disabled parking permits are available through the Nevada Department of Motor Vehicles. Contact them in advance for an application at DMV Special Plates, 775-684-4750, in Carson City, or visit www.dmvnv.com. A physician&apos;s statement will be required. Alternatively, valet parking is available at most hotels. TRAMS & THE MONORAIL - The Las Vegas Monorail offers service at seven stations between Sahara Avenue and Tropicana Avenue on the east side of the Las Vegas Strip. See the Monorail website for more information. Additionally, visitors can take advantage of trams that connect various properties: between the Mirage and Treasure Island; connecting Mandalay Bay, Luxor and Excalibur; and connecting Park MGM Las Vegas to Aria Resort, Crystals Shopping Center, and Bellagio Resort. OVERHEAD WALKWAY - There are several four-corner overhead walkway locations on the Strip. The first set of walkways is located on the corner of Las Vegas Boulevard (the Strip) and Tropicana Avenue, which connects the blocks where the MGM Grand, Tropicana, Excalibur and New York-New York are located. The second set is on the corner of Flamingo Road and Las Vegas Boulevard connecting the blocks where Bally&apos;s, Bellagio, Caesars Palace and Flamingo (next to The Cromwell) are located. 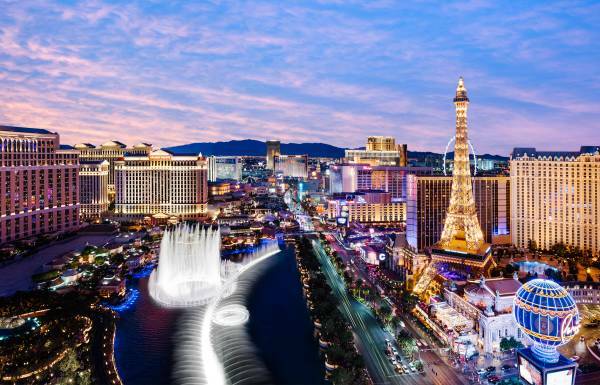 The third walkway set is located on Spring Mountain Road and Las Vegas Boulevard, which connects the corners where Treasure Island, the Fashion Show mall, The Venetian and Wynn are located. Some walkways have direct access into the resorts. Escalators and elevators are available at all locations. In addition, there is a direct-connect walkway from the front of Planet Hollywood to CityCenter accessing ARIA, The Cosmopolitan and Crystals shopping center. Also, there is a walkway connecting Veer Towers, Crystals and Waldorf Astoria. FREMONT STREET EXPERIENCE - This unique experience was created by closing Fremont Street (Downtown) to vehicular traffic, making it an outdoor pedestrian mall and doming it with the most fantastic light show you&apos;ll ever see! This area is accessible and wheelchair-friendly. Where can I find an interpreter for the deaf or hearing impaired? Where can I find personal care attendants, wheelchair, scooter or oxygen rentals? Where can I find general ADA assistance for the Las Vegas Convention Center and Cashman Center?